If you have any questions or want to enquire about dates, use our form to contact Trish Tyler or see their website for more information. 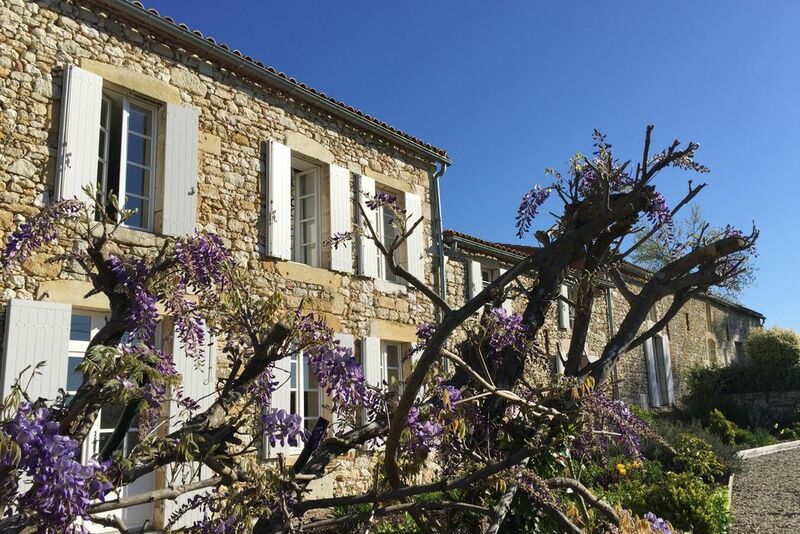 In gentle countryside of wooded valleys near pretty Ste Foy la Grande, this smartly renovated farmhouse has its origins in the wine industry; St Émilion lives and breathes wine. You will be impeccably looked after by lovely, relaxed, fuss-free owners Trish and Mark, who give you serene rooms in classical-chic style – heated stone floors, designer fabrics, African art, touches of tartan from home. All the bedrooms, upstairs and down, have big beds and super bathrooms, and dinners are delicious. Outside: a lovely terrace, a park-like garden edged with cedars and weeping willows, a heated saltwater pool. Gorgeous! Dinner €27; children over 7, €15; children under 7, €7. Wine €15-€45. Extra bed/sofabed available €30 per person per night. Lovely house, which has been converted by the current UK owners to a very high standard, and provides a very tasteful and relaxing accomadation. Trish, Mark and family are charming hosts - laid-back, but in a good way to ensure your stay is everything you want it to be. They've been here for quite a few years and have lots of helpful advice if required. We eat here on two of the nights we stayed - lovely meals ina great setting. Recommended, and wouldnt hestitate to return when in the area again. Stayed at La Girarde on our 25th wedding anniversary. Arrived early evening to enjoy tea with homemade biscuits in the garden followed by an excellent dinner served by candlelight prepared by our host. The meal was delicious accompanied by a lovely wine. The whole house is magnificent and as guests there is abundant space if required. Our bedroom opened out to the front garden in full bloom. Superb bathroom with a separate shower and bath. We chose to stay to get away from the hustle and bustle and it certainly delivers. 30 minutes from the famous and historic town of St. Emilion and its vineyards. 10 minutes from the Saturday market in Sainte Foy la Grande - classed as one of the top 100 markets in France. 40 minutes from the pretty, bustling town of Bergerac and the renowned Monbazillac vineyards. 1.5 hours from the beautiful city of Bordeaux. Mingle with the locals, shop, be amazed by the magnificent architecture and eat well in any of the many restaurants on offer. 2 hours from the beautiful Atlantic coast. Climb the Dune de Pyla, have oysters for lunch in Archachon and soak in the unspoilt beauty of Cap Ferret. 1.5/2hrs from the historic sites in Dordogne. Sarlat, the caves at Lascaux and the many Chateaux that line the Dordogne valley on your way.